Lakewood Auto Body is a locally owned and operated auto body repair and paint shop serving the Federal Way, WA community since 1962. Our services include collision repairs complete with auto painting, custom auto painting, handwash detailing, and mechanical repairs. We are a family run business and take pride in our unmatched expertise in truck or car painting Chevrolet. We boast of an ultra-modern facility equipped with the latest auto paint and repair technology and tools such as computerized paint matching systems, Shark electronic measuring systems, etc. Two on-site lifts and duel paint booths are available to ease the work of our technicians. Our paint techs are ASE and I-Car certified and capable of delivering top quality paint jobs on all Chevrolet vehicles, be it car painting Chevrolet Spark, or truck painting Chevrolet Avalanche. Did you know that after getting auto body paint, you should not buff or wax it for 3 months to allow the paint and enamel to harden? Every auto paint shop will not give you such useful paint care tips. We, at Lakewood Auto Body, give helpful guidance and always work with the customers’ best interests in our mind. In Federal Way, WA, you will find the most cost-effective and dependable car and truck painting Chevrolet with us. Car repairs such as engine overhauling, radiator and suspension system repair, AC unit recharge, etc. Why Choose Lakewood Auto Body in Federal Way? Looking for industrial finish car painting Chevrolet Sonic in Federal Way, WA? With lifetime warranty on all truck and car painting Chevrolet jobs, we offer the best auto paint service in the region. 27 years of combined experience of paint technicians. Convenience of total auto care including paint and repair jobs in a single facility. Top grade paints, enamels and industrial finishes. 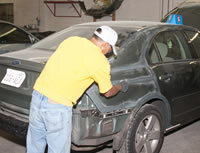 Assured restoration of your vehicle to its brand new and original look. Skilled, diligent and courteous technicians. Comfy waiting room with free snacks and HDTV.